Several years ago the European Commission created the Marie Skłodowska-Curie Actions (MSCA). It set aside €6.16 billion to last through 2020 to support the research training and career development of 25,000 European researchers – whether they are early PhD candidates or seasoned scientists. The goal is to encourage trans-national and interdisciplinary mobility across member and partner countries, and for scientists to exchange ideas which lead to innovation. One of these candidates is Matthias Kaes, a pre-doctorial student from RWTH Aachen University in Western Germany. 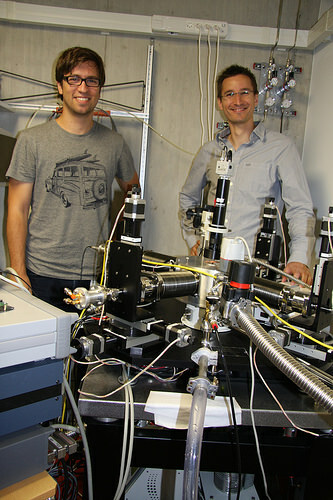 For the past eight months, Matthias has been working side-by-side with scientists at IBM Research-Zurich on the cleverly titled project called DIASPORA or Drift In Amorphous Semiconductors – A Partnership of Rüschlikon and Aachen (Rüschlikon is the Zurich suburb where IBM is located). The collaborative project is focused on the emerging field of phase change materials, a promising class of materials which are expected to be the basis for new generation of fast and durable memory to handle Big Data and cloud computing workflows. As Matthias’ time at IBM winds down to make room for other students joining from Aachen, we had a chance to ask him, and the lead scientist on the project Dr. Daniel Krebs about the experience. What motivated you to apply for MSCA? Daniel: As an alumnus of Aachen, we have very good connections to the phase change materials team who are doing some impressive and complementary work to our research. But we didn’t collaborate on a concrete project, so the MSCA call gave us the chance to formalize a project, with dedicated resources, to investigate some critical basic science which has been vexing phase change materials scientists since the 1970s. I was personally also motivated by the opportunity to interact with young minds and to exchange ideas, which is the goal of the MSCA. What did you know about IBM Research prior to joining the team here? Any surprises? Matthias: Of course I knew about the Nobel Prize research and the invention of the scanning tunneling microscope, which led to the atomic force microscope. But I was very surprised about the other research conducted here, including computer security. I was also surprised to learn about the large number of PhD students, I didn’t think this was possible at an industrial lab. Tell us more about your experience so far? Matthias: A typical day is spent in the lab where I am setting up a variety of experiments, testing, calibrating and characterizing the phase change materials under different conditions. I also participate in weekly team meetings with our co-workers in Aachen. One of the goals of the MSCA is your personal development. Do you have any examples? Matthias: It may come across as strange, but I have noticed that compared to my time at the university I am taking a lot more notes. We have weekly cadence calls with the other students, both here and in Aachen, and for these calls I need to update the team on my progress. Therefore, since I am presenting more than before, I obviously need to prepare with shorter deadlines. I find this a good “best practice” for my career. In addition, the research here is more focused. For example, I am working with one experimental set-up, compared to several in Aachen. This is enabling me to find a niche to focus on in more detail. Based on your experience, how do you think about a career in academic or industrial research? Matthias: I had the feeling before I arrived that I didn’t want to stay in academia, so this experience has reinforced my initial thinking. My experience has also opened my eyes to the level of pressure for results at an industrial lab. It’s too early to know where I will go, but I would like to at least initially start at an industrial lab once I finish my PhD. Since you are the first of several students from Aachen joining IBM what tips can you offer? Matthias: Well, you should be prepared to have patience finding a flat – demand far exceeds supply! But one thing that has really helped me to meet people and to feel comfortable in my temporary home was to join the IBM football team, which is sponsored by the lab’s Hobby Club. It was good to meet colleagues outside of work and to meet scientists from the other IBM departments. So my best advice would be to take advantage of this.